Blue Mountain Mystery: The Movie is now heading its way onto UK DVD for it's early September release. The sixth feature-length special which introduces Luke, Merrick, Owen and Winston to the series also spells the final creative contributions from long standing crew members Sharon Milller and animation team, Nitrogen Studios. Play.com have published the finalised front and rear cover arts in the lead up to the DVD rollout. 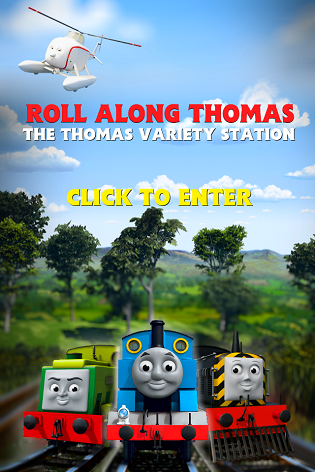 The face promises a free Kids Go Free to Thomas Land coupon whilst promoting the story as an All-new movie!. The back shows a new promo shot of Owen looking down towards Luke and Thomas who are in between each other at a points section of track by the bottom of the cliffside. Victor is superimposed in for the picture. The descriptions says; When trouble strikes at the Blue Mountain Quarry, Thomas is sent to help his narrow gauge engine friends. While shunting and hauling, he discovers a little green engine hiding in the tunnels. Thomas is determined to get to the bottom of the mystery but discovering the truth is harder than he imagined! Will Thomas be able to help his new friend? Or will the little engine be sent away from Sodor forever? Find out in Thomas' greatest adventure yet! Blue Mountain Mystery is now showing in Australia at Hoyts cinemas, every weekend at 10:30am till September 16th. The DVD is released on September 19th. Kidtoon Films are currently hosting the movie in various cities in the United States of America for August 2012. The DVD and Blu-Ray bundle hits stores on September 18th. The UK premieres the film in Vue cinemas for two days only on September 1st and 2nd 2012. A celebrity blue carpet launch at Vue Leicester Square is to be simulated on the first date. The DVD comes out on September 3rd.